By Bruce Dzeda, 50 pages, fully illustrated, Kent Historical Society Press, published 2010. 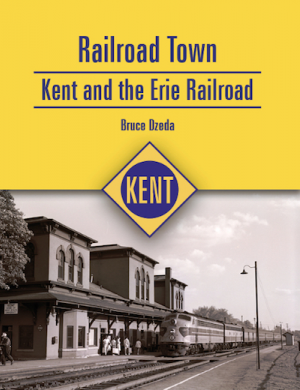 This profusely illustrated book traces the history of the Erie railroad from its inception as the A&GW railroad and the profound effect it had on the economy of the city of Kent. The book is filled with historical photos of the railroad from the early steam engines to the powerful diesels. The timeline tracks Marvin Kent's vision for the rail line through to the final days of passenger service as well as giving the reader a vivid picture of the many immigrants that settled in Kent and worked in the rail shops and the social impact they had on the city. The book has over 60 historical photos, maps and illustrations that amplify Mr. Dzeda's wonderful narrative. Construction work begins on the Atlantic and Great Western Company of New York. By the end of the year, Atlantic and Great Western Company of New York opens from Salamanca to Jamestown.